When we launched VivaKi REAL Social for EMEA we promoted the event with a Twitter hash tag #REALsocial. This was a great success and in the REAL Social wrap up I wondered if Twitter hashtags could replace the 'AOL keyword' or the 'Search on Google for.....' credits at the bottom of posters? Well a major brand has now done this - doubtful that it's my influence, but very interesting all the same! 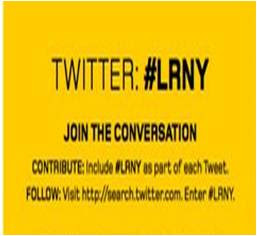 Land Rover are also encouraging people to use Twitter Search to track conversations that are happening under the #LRNY tag.